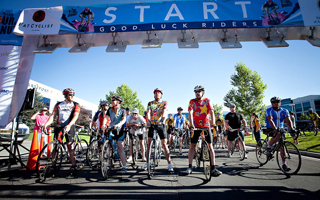 REGISTER NOWJoin us for the 12th Annual Utah Tour de Donut will be held on August 10, 2019, in Highland, Utah! Ride. Eat. Ride. Eat. Ride! New to the Utah Tour de Donut? Check out this video to the left see why the Utah Tour de Donut is "the most ridiculous, preposterous and generally awesome race in the whole world... I arrange my entire summer around this event. And so should you." Rotary Club of Mount Timpanogos, Utah County, Utah. The Utah Tour de Donut sounds like an extraordinary event, right? Well, it is! And here are the photos to prove it! Volunteers make or break the success of the event for the riders! We anticipate 400 riders this year, so there is plenty to do. Never ridden in Utah’s craziest race? Well, there’s nothing too it, really! You’ll want to read these tips in preparation for the race!